The listing photos for the “1,711 sq ft” Manhattan loft on the 5th floor at 77 Hudson Street show a loft with some “classic” elements, as advertised (chiefly, the truly massive columns and beams, less so the large living room windows). As you have already guessed from the headline, when I saw it with a client this Spring we were both very unimpressed. Looking at those nice, clean photos, I am struggling to remember why…. And based on the eventual clearing price of $1,862,500, The Market was not overly impressed, either: $1,096/ft does not sound like a lot for a boxy floor plan with 3 exposures and great beams with a chef’s kitchen, especially not for a Tribeca condo loft about midway between Nobu and Bouley. It sold more like a primitive loft than a finished loft, despite the pictures that might suggest otherwise. I think it is the ceilings, being not much more than 9 feet and dropped, at that. In that second photo, my head is starting to duck involuntarily as I imagine walking toward that windowed corner. Ot it might (also) be that bath, the only one in the place. I get that some people really like the (European?) no-shower-stall-so-floor-gets-wet thing, but would the second bath be added. 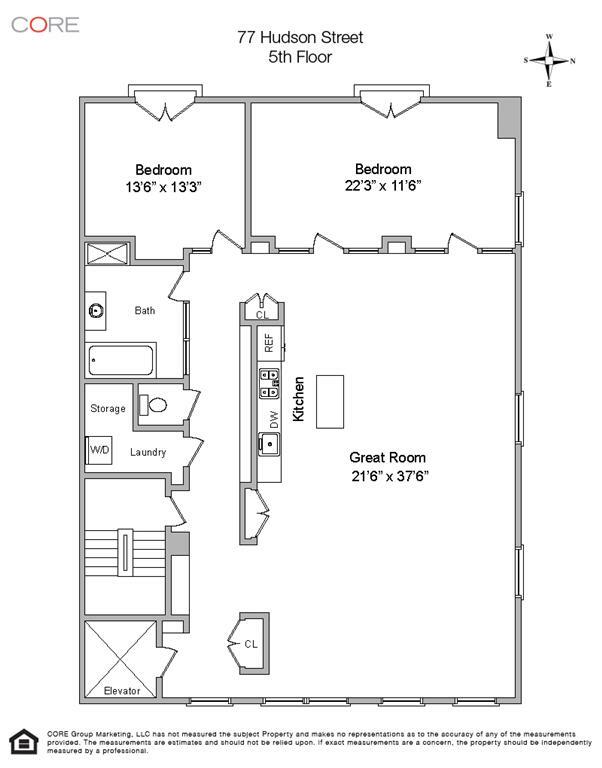 Before you say “in the laundry area” notice where the toilet is on the floor plan. Or maybe it is those “opaque glass doors that permit light to pass through while offering privacy” between the public space and the two bedrooms, but which actually look rather flimsy and don’t offer much visual privacy at all. This is not a confession: I love Manhattan lofts, especially “classic” lofts, especially in Tribeca. I think my buyer and I were in an out of here in about 4 minutes when we visited. There was just nothing there other than the beams and columns that really appealed to him (us). Other than the opportunity to more or less gut the place and start over, with great beams but without great bones. The “1,650 sq ft” Manhattan loft ##4B at 142 Duane Street that I hit last week in my November 5, a bidding skirmish? 142 Duane Street loft nudged above ask, is a fascinating comp for the 5th floor loft at 77 Hudson Street, as that cleared at only $1,152/ft, a mere 6% premium to the 5th floor on a dollar per foot basis. That one had a full set of classic loft attributes, including the ‘volume’ boost from 14 foot ceilings. It had to cheat a little of that volume to fit the second bedroom (with much more solid looking smoked glass panels than at 77 Hudson), but has 2 baths. Although it claims condo rules, 142 Duane Street is a coop, with monthly maintenance 57% higher than the real estate and common charges of 77 Hudson; that $827/ft difference would support about $170,000 in mortgage principal at 4%. It is probably not a coincidence that the 5th floor at 77 Hudson did not go into contract until #4B at 142 Duane zoomed through the market. 77 Hudson is a small building, converted to residential condominiums in 1998 (judging from the original sale prices, my guess is the original unit owners sponsored the condo: 3 paid $146,000, or $86/ft). There are 5 residential units; only the 5th floor has been sold by an original (1998) owner, and the 5th floor has now been re-sold 3 times since 1998. That’s weird. Not as weird as the bathroom arrangement on that floor, but weird enough.